Lacey Anderson departs Bacerac in northern Mexico and heads out on her favorite type of adventure: running undiscovered rivers. Faced with pending monsoons and little beta, she unveils the reasons she loves multi-day expedition trips. Neil and I were about to embark on the first raft descent of the upper Rio Bavispe in northern Mexico, a tributary of the Rio Yaqui north of the infamous Copper Canyon. As far as we knew, the river had been run only once, by an exploratory kayaker. This was my favorite type of multi-day expedition, a challenging trip with unbiased expectations, unanticipated situations and little beta. 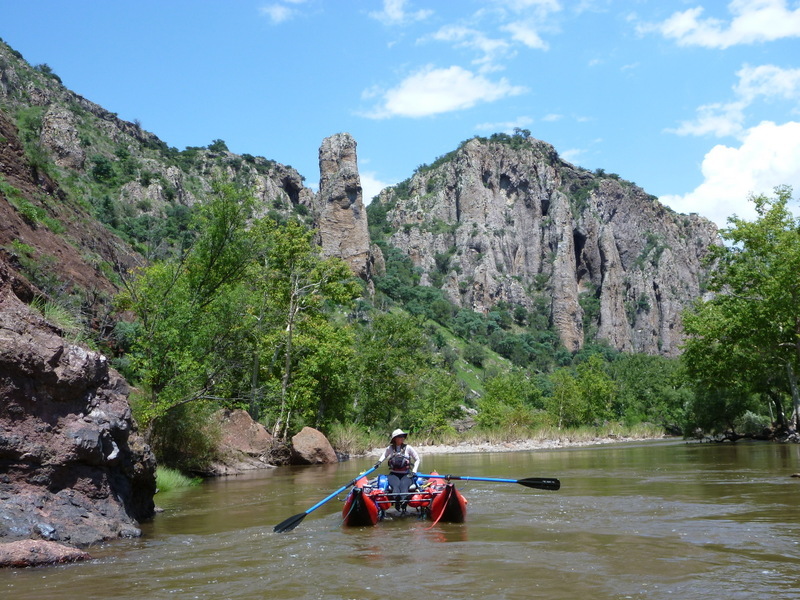 I had been exploring Mexican rivers for the past few years, devoting many trips to the waters just across the southern border in Sonora and Chihuahua. Our plan for Rio Bavispe was to run 103 kilometers from Mesa Tres Rios to Bacerac in five days, an easy pace. It turned out that we would have to hustle to make it to the take-out on time. It was a six-hour drive from the Arizona border to Bacerac. A quaint park on the lakeshore above our take-out, the Bacerac diversion dam, offered the perfect spot to set up camp. We estimated the flow into the dam at about 25-30 cumecs (about 1,000 cfs), which, roughly, corresponded with the gauge downstream at La Angostura II, which was reading 30 cumecs—an average flow for August. With the flow so low this far downstream, we wondered if there would be enough water 100 kilometers upstream at the put-in. We had just enough time to cook dinner in the waning Mexican sun. Sleep did not come easy. Truck-camping in public places of Mexico always makes me a bit anxious. Once I finally drifted off, thoughts of another grand adventure—beautiful canyons and undiscovered rapids—floated in and out of my mind. With the sun rising over the dam, we began our shuttle-driver hunt. We walked circles around the small pueblo searching for a willing driver. None of the taxis loitering at the plaza agreed to help. The lady in the town store called us el loco when we inquired about finding a driver. Apparently we needed a chofer especial for the mountains, not just an ordinary taxi driver. Finally, Senor Davila agreed to help us out. He rounded up a muy bien driver, Pasqual. Pasqual would have made a great rally driver. No matter the road conditions, he whipped the truck around curves, through potholes, up and down mountains, all at one speed: fast. I think Pasqual “Andretti” would be an appropriate name for him. All we could do was hold on and enjoy the ride – as the fuel gauge rapidly decreased. We gassed up at a little tienda along the way that sold gasoline, out of a barrel, by the liter. Local people told us it would take us another four hours to drive to the put-in. (Pasqual made it in three!) After unloading the boats and equipment, Pasqual drove our truck back to town where it would sit for the next five days, until it was time for him to pick us up at the take-out. We had visions of him careening around corners way too fast, and were a little worried about our truck, but the excitement to get on the river and start our adventure outweighed our vehicular concerns. We just hoped we would find our truck in one piece at the end of this journey. We put the boats together and launched on what we estimated to be ten cumecs (350 cfs), a bit too creek-like for our taste. What would we encounter at these low flows in the canyon below? What would happen to the flow if it rained? We were still hopeful we could get our boats down without serious problems, but this angst was one of the reasons I loved this type of trip. There was a strainer under the bridge just below our launch point, but it didn’t present too much of a problem. The next morning the water was even shallower. Good thing there was nothing more than Class II expected on the first full river-day; trees in the water turned out to be the only major hazards. That night, in camp, we marveled at the fact that no one had ever rafted this exceedingly scenic river. Tucked in a meadow of vibrant green cottonwoods, below a series of stark-white limestone rock caverns, I rested my paddling shoulders and thought about what I loved about river exploration. Being the first person to boat a river and discover, first-hand, how beautiful the canyon can be. Being one of the first to run the rapids and creating our own beta. But more than the beauty and beta, the thrill of isolation and the challenges of running rapids without the comfort of other boaters, or scheduled ranger checks, lured me toward the undiscovered. Out there, alone, the danger was tangible—if things went wrong, death was possible. On day three, the water was again down in the morning. Luckily, we still had approximately eight to ten cumecs with the small amount of water coming in from the arroyos. My slightly worried mind (about the low water) was distracted by the contrasting natural beauty all around. In this section, there were intricate formations, caves, and alcoves cut out of the limestone river walls. 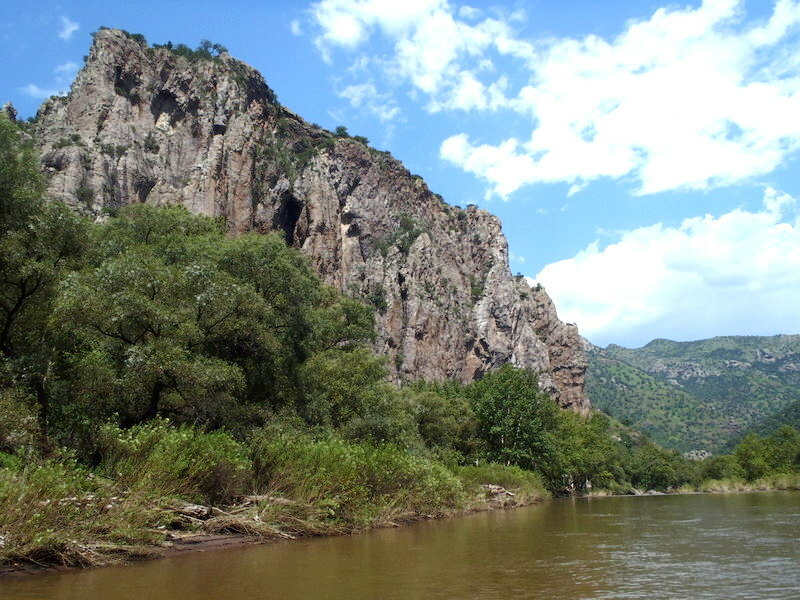 In the afternoon, we contemplated stopping before entering the Barranca Bavispe, a ten-kilometer steep-walled canyon filled with Class III-IV rapids. But the high sun convinced us we had time to casually search for a good camping spot. Alas, there were no decent spots along this section. Around 3:30 we found what could have been an acceptable campsite for the night and debated stopping before entering the canyon below. I was a bit concerned about committing to an unknown gorge that late in the day. 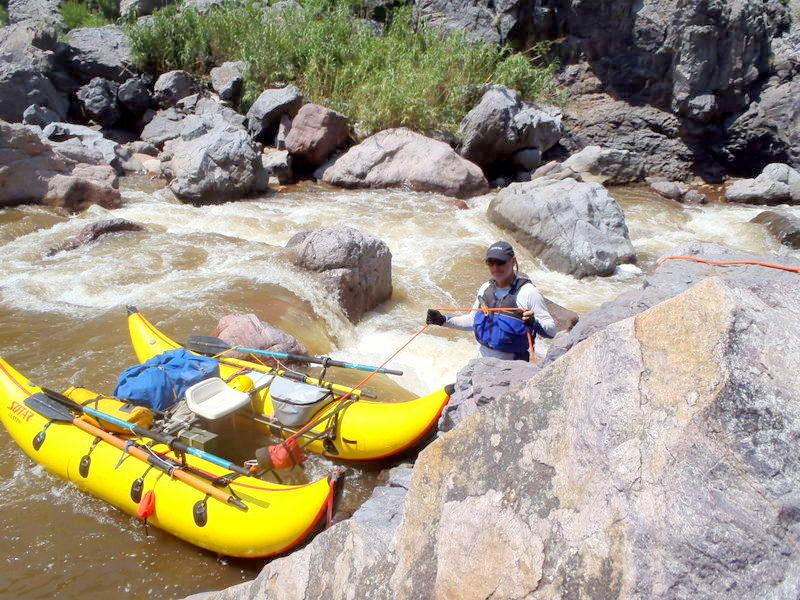 The beta on the first big rapid “Muralla” was that it was class IV and might be tight for a raft; we had our small catarafts, so it shouldn’t be a problem…right? We talked ourselves into the narrowing canyon walls, the daylight fading beyond the rock. I was soon berating myself, though: “Oh &$#, this is stupid. This is not safe!” We were in a narrow, steep-walled canyon, apprehensively floating closer and closer to the too-tight-for-rafts-class-IV Muralla rapid. And to top it off, we faced the encroaching darkness. Muralla did not look good. At this low flow, there was a left slot about three-feet wide with a five-foot drop onto a guard rock before heading down a calm passage between the cliffs and the huge boulders in the streambed. Unfortunately, the calm passage was near vertical-walled and only about two-feet wide at the narrowest point—our boats were six-feet wide. The right slot at the top was a bit wider and less abrupt but led into a completely unrunnable sieve where all the water went under the boulders, or off toward the left passage. Muralla was a mandatory portage for us, but how? Strenuous investigations delivered a route on river right that would allow us to get around this obstacle. But it required us to completely break down the boats and take them piece by piece over huge boulders, into a small cave, and through multiple narrow reed-choked passages to reach the other side. (At least we could leave the tubes inflated.) The portage ended up taking about two-and-a-half hours, and by the time we were done, it was dusk. With the portage complete, there was no place to camp. We re-rigged and kept going, the ebbing light casted shadows on the next Class III rapid. By the time we got to the second Class III, I could only distinguish the whitewater when my tubes were upon it. Without unpacking our headlamps, I could see my hand, but not much farther away. My nerves were frazzled. Running rapids in the dark, navigating only by sound and feel, would not be added to our list of criteria for river exploration. I vowed to never experience that again. To make matters worse, clouds, dense with moisture, thickened the sky. Panic mode crept up on me. My eyes searched frantically for any suitable camp. It would have to be well above the river, or the fear of rising water would keep me awake. I was about to break down in tears when a tiny cobble bar appeared on the river left. We pulled our catarafts ashore and glory be(! ), there was a high bench. It was covered in a thick forest of giant reeds, but a high bench none-the-less. I beached the cat and ran up the slope, trampling the reeds to make a spot for our tent. Neil found a high spot to tie off our boats. This bench should be safe if the water came up, a likely occurrence in this season. Pending monsoon or not, we didn’t have another choice. That night it sprinkled, but the water only rose a tad. We were fully into the Barranca Bavispe and the major rapids of the trip were on the coming section. How would they compare to Muralla? 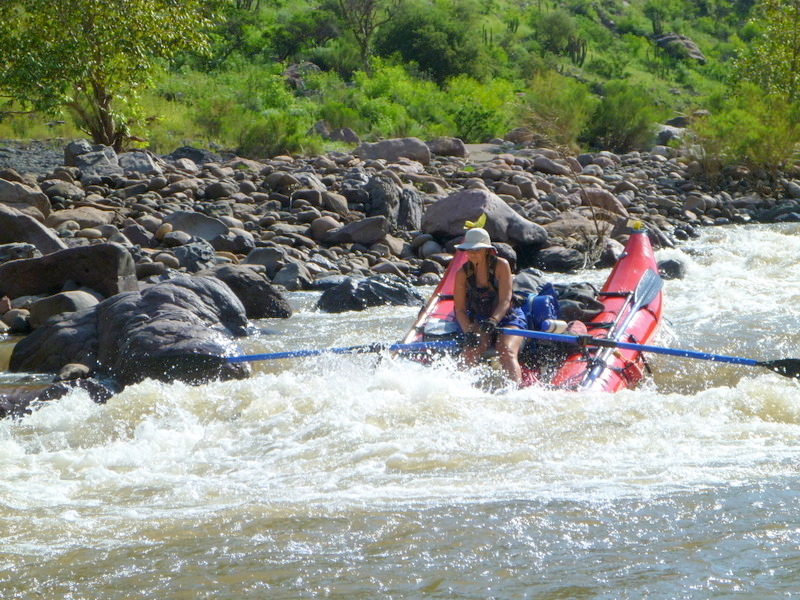 With low water, some of the rapids required lifting a tube to get through slots that were narrower than the boats. 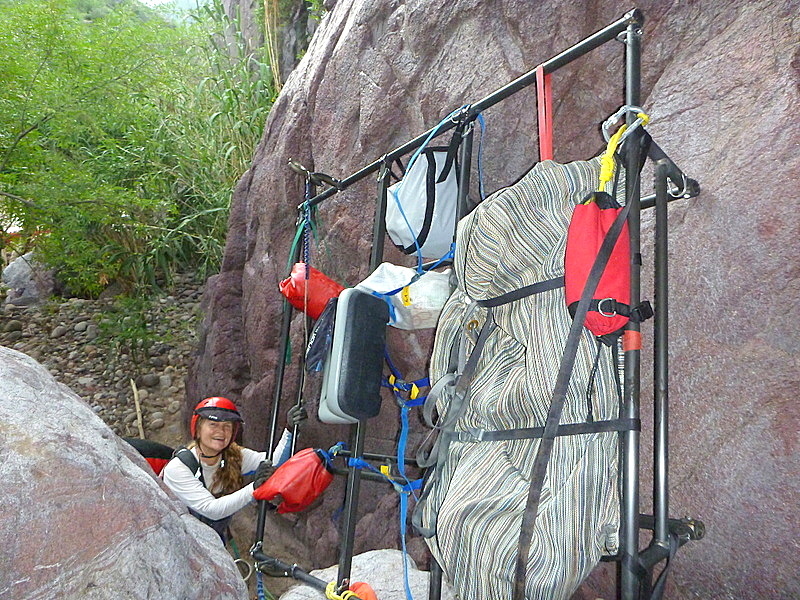 One rapid, “Gato,” required a scout and a bit of ingenuity to run safely. There were several slots at Gato, none of them wide enough for the boats. We scratched our heads in frustration. We decided to line the boats over the first drop and pull them in below where we could jump on and run the rest of the rapid. Neil rigged a friction brake by roping around a small tree and anchoring again around a boulder. In case the boats got away from us in the current, and the first point of friction failed, we had the boulder as a back-up brake. The invention worked great, albeit largely unnecessary; he was able to hold the line and let each boat down, where I stood to pull it in to shore. The problem-solving challenges that occur on exploratory trips are just another reason why I love to run the undiscovered. After the tree-brake-boat-descent were several Class III+ rapids with plenty of read and run opportunities, my favorite way to conquer rapids. The extreme isolation of river exploration is another aspect strongly appreciated. We had this entire canyon all to ourselves. And when we approached a stream feeding into clean, deep swimming holes, there were no crowds to cause hesitation. We shored our boats and relaxed in the clearer waters. Finding swimming holes off of the Rio Bavispe are always appreciated. Although the August weather was a balmy 80 degrees, after kilometers of chocolaty, monsoon runoff, the clearer water was refreshing. The last difficult rapid of the trip we’d anticipated was “Angel’s Cesspool,” and at this low level, it turned out to be another puzzle. The river was completely blocked by large boulders. A downed tree created a cave-like passage with some of the rocks on the left. The right slots were only about two-feet wide. If only the water was five feet higher, we could probably have run right over the boulders that were blocking us. Our solution was to lighten the boats by carrying most of the gear to the bottom. Then, we were able to lift the boats onto the right side boulders to slide them down on the other side. This process took us about 90 minutes, once again slowing our pace on the river. We thought that Angel’s Cesspool would be the last big challenge. The canyon opened below her and the current slowed. At one point, a large, tree-covered island split the river. (This is not an infrequent occurrence on low-flowing rivers that depend on the monsoon season to raise water levels.) The right side entrance was extremely shallow, while the left side looked to narrow downstream. I always dread choosing a channel when it’s impossible to determine what lies farther ahead. We chose the deeper, narrower channel on the left. About a half kilometer down, the channel was blocked by trees and we were forced to portage, thankful for the island’s presence, light boats, light gear and minimal remaining provisions. Downstream was another mid-channel tree that forced a quick highside to keep from flipping. Just more examples of unanticipated situations you can be faced with when exploring. Portaging at Angel’s Cesspool, and the portage at the island, forced us to camp further upstream than planned. 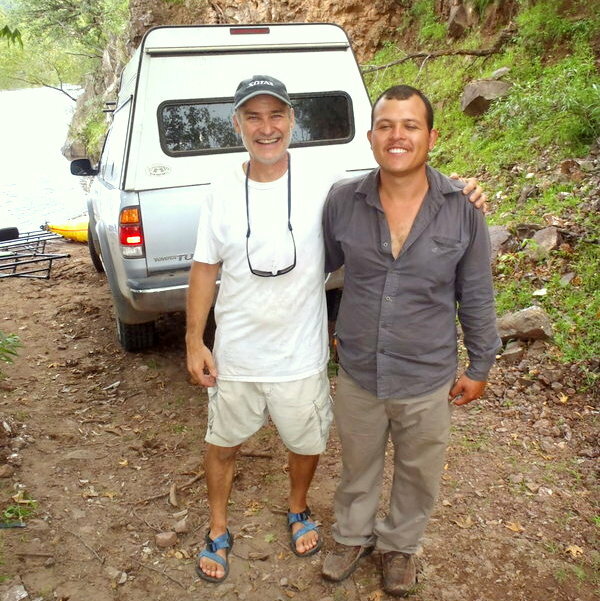 We had 22 kilometers left on the Rio Bavispe on our last day, and we had to row those 22 kilometers by noon in order to meet Pasqual and our truck. We made it to the take-out 30 minutes past our eta, and our truck was not there. Various irrational thoughts involving our truck and Pasqual’s driving staggered through my mind: Did he careen over a cliff? Hit a tree? Did he just steal our truck? We stood, puzzled, in an empty lot with all of our gear and a lone set of tire tracks. After drying out our equipment, eating lunch, and slowly de-rigging the boats, Neil decided to walk the four kilometers into town to see if he could find Pasqual and our truck, or at least one of them. Once in town, Senor Davila informed him that Pasqual had to go to the border due to an emergency. But, the truck was safe and secure at Pasqual’s friend´s house, only, Senor Devila didn’t know exactly where that friend lived. So, off they went to find it. Neil said he felt a bit like he was being driven around town for the fun of it, wondering if the truck was really there or with Pasqual. They did, indeed, finally, find the truck, at Polo’s house. Polo was a good guy, the truck was safe, and Pasqual did have an emergency to attend to. Neil raced back to the park to check in with me. By then, I had everything cleaned, packed and ready to load. Feeling satisfied that all ended well, we loaded up and headed into town for cervezas. In spite of the difficulties, we completed the run within the allotted days and time. No one got hurt, and we were happy to have found another Mexican shuttle driver—Pasqual “Andretti.” Like all great expeditions, the Rio Bavispe had its many challenges; we faced low-water conditions, the possibility of rising water, a difficult portage, an extreme lining, river-wide blockages, and exhilarating read and run rapids. I realize not everyone enjoys the stress of this style of boating, but for me the stress is worth it because there is nothing that compares to experiencing first-hand the beauty and challenge of a river that has not been discovered.